If your plan trip of vacations for Costa Rica don´t allow you visit La Fortuna zone and the Arenal Volcano for more time, we offer you these day trip options, so you do not miss the experience of enjoying one of the most beautiful areas of the country. This excursion to Arenal for a day leaving from San Jose, allows you to go from the city to the tranquility of dense forests, breathtaking views of the Volcano and Lake Arenal, as well as the opportunity to live the adventure in one of the adventure tours and relax in the well-known hot springs; Baldi Hot Springs or Tabacón Thermal Resort & Spa. 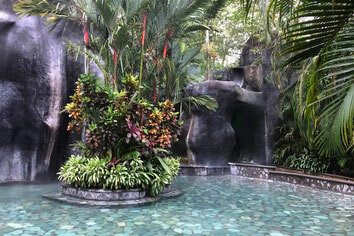 If you are in San Jose and you have just one day to visit La Fortuna, we offer you this option to enjoy one of the main attractions of the area, BALDI THERMAL RESORT & SPA, a complex that offers all the facilities to relax and have fun in the Hot Springs that emanate directly from the majestic Arenal Volcano. A perfect combination for a deserved rest in the medicinal Hot Springs with multiply benefits for the health. 25 beautiful pools of Natural Thermal Water, of different temperatures from 33 º C to 67 º C, which are certified by the NAL (National Water Laboratory) of the Government of Costa Rica. Extreme water slides adding adrenaline to your visit. Area specially designed for children to enjoy the most safely. Facilities: Bathrooms, showers, dressing rooms, ample parking, use of towels or cloths. Others Services with extra charge: Restaurant, Handicraft shop, 2 bars, 3 bars in the pool, Spa for massges, Lockers with keys. Rate varies according to the number of people and the option chosen, please fill out the form that you will find in the bottom part to send you the quote. 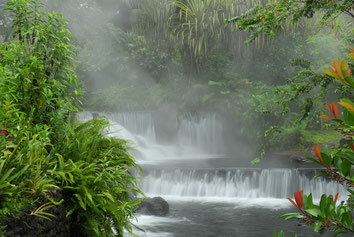 Experience the essence of nature visiting of naturally flowing thermal mineral springs in Arenal Volcano area the most beautiful private, rainforest reserve and tropical gardens: Tabacón Thermal Resort & Spa. When you arrive to TabaconThermal Resort literally arrive you to the heard of the jungle, so expect the sounds and sights of the native flora and fauna to flood your senses. This is where the thermal experience begins. 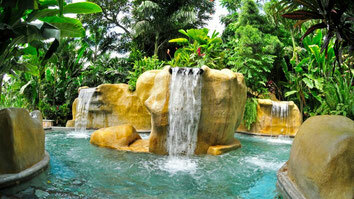 There are five main springs source highly mineralized water that is heated underground by the Arenal Volcano’s magma. Thousands of gallons of this perfect water naturally emanate every minute. 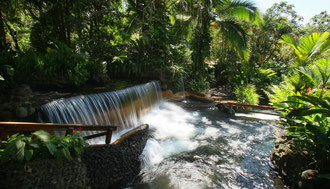 The thermal water flows throughout the resort, forming the Tabacon River. You will find dozens of cascading waterfalls and warm pools along the riverbed, of varying temperatures, water flows and degree of privacy. Let us know which activity you would like to include and we send you the total price. To reserve or more information, fill out the following form, as soon as possible our reservations department will be answering your request.